98458 Italian landscape circa 1645 (1630-1652) Medium oil on copper mounted on panel Dimensions Height: 51 cm (20.1 in). Width: 70 cm (27.6 in). 98459 Italian landscape by evening. circa 1645(1645) Medium oil on panel Dimensions Height: 46.5 cm (18.3 in). Width: 60.5 cm (23.8 in). 98460 Italian landscape with draughtsman. 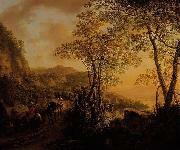 circa 1650(1650) (1630-1652) Medium oil on canvas Dimensions Height: 187 cm (73.6 in). Width: 240 cm (94.5 in). 98456 Italian landscape with mule driver. between 1640(1640) and 1652(1652) Medium oil on panel Dimensions Height: 37.5 cm (14.8 in). Width: 50.5 cm (19.9 in). 98457 Italian landscape. circa 1645(1645) Medium oil on canvas Dimensions Height: 108.2 cm (42.6 in). Width: 125.8 cm (49.5 in).